Slick design, statement furniture and modern fittings, that is the legacy hotelier Ian Schrager and designer extraordinaire Philippe Starck have left at The Sanderson. More than a decade after the hotel opened it's still an achingly hip place to stay. 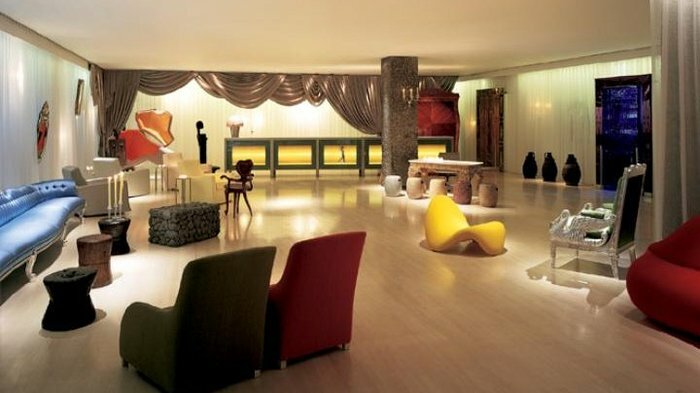 Located close to Soho, The Sanderson is testament to the success of the Schrager-Starck design partnership. Slick design, statement furniture and modern fittings, this is what you get from the Schrager-Starck design partnership - combining the talents of the man behind the legendary Studio 54 and the French designer who has made us rethink the look of everyday objects. From the funky lobby and the bar (very busy on weekends) to the lift and up to the roof terrace - where you can have a lazy breakfast - this is a hotel to be experienced. It just goes to show what you can do with an old 1950s office block. Just off the Long Bar, The Restaurant blends cutting edge design with a seasonal British menu. Located just off the Long Bar in the stylish Sanderson hotel, The Restaurant at Sanderson blends cutting edge design with a seasonal British menu and artisanal cocktails. This modern continental brasserie serves globally inspired seasonal cuisine so in summer you'll find choices of rump of beef, roasted salmon and toasted barley risotto among the mains. Retreat to the greenery of the courtyard garden for dinner or enjoy a lazy lunch. Climb through a rabbit hole and explore a culinary wonderland. Climb through a rabbit hole and explore the wonderland beneath at the Sanderson's Mad Hatter's Afternoon Tea. Served in the hotel's Courtyard Garden, an open-air retreat with flowering trees, fountains, mosaics and a reflecting pool, diners are fully encompassed in the magical affair. Creating a twisted version of the traditional British afternoon tea, the chefs at the hotel have mastered an unconventional and adventurous experience for all taste buds. Offering an 'Eat Me' Queen of Hearts which holds strawberry and cream mousse, as well as an intriguing 'Drink Me' bottle containing a concoction of Apple Pie, Lemon Curd and English Toffee, the dining experience will engage your senses in a bizarre yet enjoyable sensation. Further gastronomic adventures include blueberry lollipops that turn your mouth from hot to cold, hazelnut praline ice cream, chocolate rabbit clocks and finger sandwiches presented in a rainbow of colours. Taking a step back towards tradition, scones with clotted cream and jam are also on the menu. An authentic Malaysian culinary experience. London's Sanderson hotel has long been the place to go for a very swanky champagne cocktail in the Courtyard Garden and Suka is the place to go for post-champers nosh. Very handy as you can just nip to the other side of The Long Bar (also utterly chic) to get to your table. All this Vogue-style sophistication comes at a price that's not just about the bill but if you can get over the pretentiousness (or just join in) it's great fun. The setting inside a "hidden" space and outside in the Garden Terrace is magical and all down to designer India Mahdavi's exquisite attention to detail. And the food - French cooking techniques preparing British and Malaysian ingredients to create south-east Asian flavours, all thought up by New Yorker Zak Palaccio. The experience promises not to be a dull affair. A fab place to have a posh breakfast too. Some 80-feet in length, The Long Bar goes on and on. For a little refinement and an expensive tipple, the Sanderson Hotel's Long Bar and Courtyard Garden is a very exclusive sanctuary. The courtyard is something of an urban oasis; modelled on a Japanese garden, it is crammed with colourful mosaics, Oriental flowers and streaming fountains. In the evenings the tiny little night-lights shine out from beneath the undergrowth. The Long Bar is hugely chic but is still one of the more accessible of London's many flashy bars. Inside, it's sleek, modern and starkly white and - as you'd expect from the name - it possesses one of London's longest bars, some 80-feet in length. Posh punters perch on eye-stencilled bar stools to see and be seen. Providing you're dressed to kill, you'll find the staff and clientele a little less aloof than in London's other high-brow establishments. The bar serves all manner of Martinis and champagne cocktails, including some outstanding house specials. This modish saloon gives you a taste of the high-life even if it just for one night. The guests-only lower level Purple Bar serves the best martini list in London. Seductive, low lit and purple, very purple, the guests-only lower level Purple Bar certainly lives up to its name. With lots of velvet and candles, lavender Queen Anne chairs and purple etched Venetian mirrors, it's the perfect place for a romantic drink and my what a great cocktail menu they have to choose from including what could possibly be described as the best martini list in London. There's a strict "hotel guests only" rule so when The Long Bar gets too busy (and it does), hotel guests can feel smug and retreat to the embrace of the Purple Bar's plush velvet seats. A calming, relaxing and heavenly spa. 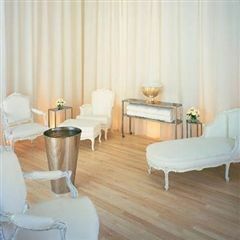 Walking into the clean white space that is the Agua Spa at The Sanderson is instantly calming, relaxing and heavenly. There are 14 private treatment rooms, a steam room and a gym with state-of-the-art equipment, free weights area and cardio theatre. Private relaxation suites and a central relaxation lounge complete what must be one of the most luxurious ways to be laid back while in the heart of the city. Arriving at least 15 minutes before your appointment will help you make the most of it and avoid any pre-spa stress. Treatments include Aromatherapy Associates or Eve Lom facials and massages range from Reiki and reflexology to reviving; there's even a mother-to-be option if you're expecting. The spa is strictly for use by members and hotel residents but if you want to visit for a day membership fee is charged in addition to treatment costs. From cheap budget hotels to luxury 5 star hotels see our special offers for hotels, including Grange Blooms Hotel London from 57% off.